Blueboard and Plaster versus Sheetrock and Joint compound: Understanding the differences ! When it comes to installation of your walls and ceilings today’s construction relies on one of two types of systems, they are blueboard and plaster, or sheetrock and joint compound. 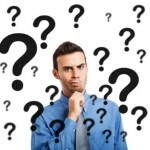 This page contains a brief discussion about the frequently misused term drywall, followed by a chart to compare the differences between one coat and two coat plaster methods as well as sheetrock and joint compound, then finally for those who want a bit of information overload, a more in depth discussion about it all. Its more complicated then you might think. The word drywall is commonly used mistakenly by the general public when talking about sheetrock, which is normally finished by using joint compound. Technically the word drywall includes a wide range of products. The most common three types of drywall are sheetrock, blueboard and green board, also known as moisture resistant board. 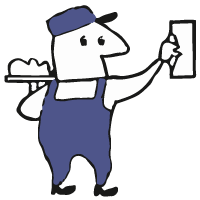 Other categories of drywall include fire code rated, high strength and light weight. There is even drywall specifically used for exterior ceilings. The thickness of drywall ranges from one quarter inch all the way up to one inch for specialty uses such as in elevator shafts. The two standard sizes for drywall are 4 by 8 foot and 4 by 12 foot sheets, but they also come in other dimensions. Drywall consists of a core made mostly from a soft mineral called gypsum. Other materials such as fiberglass fibers for strength, or water resistant compounds for green board can be added to the gypsum. This core is then wrapped in various types of paper depending on what it is used for. Government building regulations frequently dictate when and where which type of drywall and how many layers of drywall must be used. 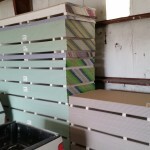 A stack of various types of drywall. Substrates finishes can be applied to Blue board, Sheetrock, Steel mesh lath along with most surfaces treated with bonding agent including paint brick, concrete, cinder block and wood lathe for historical landmarks designated home Blue board, Most dry surfaces treated with bonding agent, however if large areas Kal-Kote highly recommended. Sheet rock, some painted surface but has a higher rate of separation from surface depending on paint and other variables. Hardening of finishes Chemical reaction with water Chemical reaction with water Primarily a drying action however there are some compounds that do harden through chemical reaction but they still do not have the tensile strength of base coat plaster. Shrinkage None None Varies Setting joint compounds have low shrinkage. Non-setting have lots of shrinkage as it dries and the bigger the fill the worse the shrinkage and resulting cracking. Tesxtured finishes Widest range of possible styles Many styles possible Primarily popcorn and knock down, which advertise the fact it is a lower quality sheetrock system. Some plaster finishes can be mimicked but tend to look amatuerish compared to plaster. Is sanding required No sanding needed No sanding needed Yes sanding needed. Time to make a lot of dust. Time to complete work Patches, and overlays depending on square footage can be usually be finished same day. 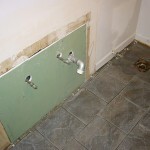 Patches, and overlays depending on square footage can usually be finished the same day. Overlays take slightly less time then two coat. 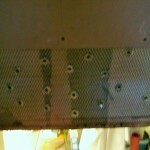 Patches, and overlays can take several days because drying must occur between coats of Joint compound and before sanding. Blueboard is covered in a paper that is feltier or more fibrous. When plaster is applied these microfibers become imbedded in the plaster for greater adhesion. The paper has also been treated with bonding agent, again to improve plaster bonding to the paper. Unlike sheetrock, the paper on blueboard is very porous which creates a suction on the wet plaster thus drawing the wet plaster into the pours for still greater bonding. This suction action is an important property when it comes to troweling the plaster smooth and makes life much easier for plasterers when compared to plastering over other surfaces. Blue board must be used with one coat plastering and is the preferred substrate for two coat plastering although sheetrock can also be used with two coat plaster but it does represent additional challenges to the plasterers. You cannot use joint compound to finish blueboard. There are also other substrates that plaster can be applied to such as steel mesh, or wood lath as seen with the old horsehair plaster, which may be required if your property is listed as a historical landmark building. Preexisting surfaces that are structurally sound can be coated with a bonding agent and resurfaced with two coat plaster. There are several different types of plasters and several manufacturers of blue board. Each company’s product has slightly different properties when it comes to how they are applied and worked to a finish. Pairing the right plaster and blueboard together matters to plasterers, so if you are thinking of installing your own blueboard and have a plaster finish it, make sure you consult them before buying materials. In the end the finished product you end up with is a stone surface covered by paint. Plaster application and finishing requires much more skill then mudding sheetrock, as you cannot effectively sand away bad plaster work without having negative impact on the quality of the finished product, so you have to get it right the first time, every time. Plasters come as a powder and must be mixed on site at the time of use. All plasters utilize a chemical reaction we called setting to get hard, just like cement. Plaster can withstand getting wet and being exposed to high humidity areas much better then joint compounds can. There are many different types of plaster and each plasterer has his favorites. Here in the Midwest the most commonly used brands are Kal-Kote and Unikal. Kal-Kote is a two coat system which consist of an extremely hard cement like base coat which is applied to the blueboard and then is finished with either a smooth plaster or a texturing plaster. Unikal is a one coat system which is applied directly to the blueboard after the joints have had a coat of Kal-Kote base coat put on them. Unikal can also be used for texturing as well as for smooth finishes. There are also different additives for plaster to speed up the setting action or slow it down. There are fillers that can be added to make plaster less dense when it needs to be applied to metal lath, wood lath or if thick plaster is needed to feather out deep transitional areas or to fill big holes. Sands can also be used to get different texturing effects. Plaster, because of its properties and the fact that you cover the entire surface instead of simply making a raised mound over what you are trying to hide as with joint compound, allows the plasterer more leeway in utilizing trade secrets to create a more durable and uniform surface for paint. There are many factors that impact how plaster reacts. Substrates, temperature, humidity, air flow, what is in the water and how long you mix it all must be taken into account by the plaster to decide if he should use additives and how much to mix up. The amount of area you are trying to cover, how many corners you have to deal with and how thick you need to lay it on as well as is it a one coat or two coat system, is it a smooth finish or a texture and what type of texture as well as is it being applied to a bonded surface all dictate how thick you will want it. It quickly becomes obvious why the untrained should not use plaster. There are different for plaster and joint compound are not interchangeable. There are many different styles of paper and fiberglass mesh tapes as well as a wide variety of beads and each of these products has a specific purpose. Tapes: Despite what many amatuer may say the manufacturers of joint compound state that fiberglass mesh tape should not be used with drying / non setting joint compounds. Joint compound does not have the tensile strength needed to prevent cracks from appearing. 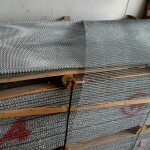 Mesh tape is also thicker then paper tapes and will result in humps that are very difficult to prevent from being visible once the surface is painted. Fiberglass tapes can be purchased in widths ranging from two inches up to six feet. The narrower tapes are used for joints and the wider ones can be used to reinforce large cracks. When resurfacing old horse hair plaster or severely damaged walls the wider mesh tapes can be imbedded into the base coat plaster to help prevent future cracks or to stabilize the wall. Beads: There are many different types of beads, stop beads, J beads and expansion joints are just a few. Corner beads are used to finish outside corners, J beads and stop beads can be used to prevent moisture from wicking into the drywall or to give a straight edge to the wall where it butts up against an irregular surface.These beads can also be used to create some very unique architectural features such as recessed or protruding offsets. Expansion beads are rarely used in residential homes because they leave a visible line in the surface however when it comes to very large ceilings and walls you run the risk of cracks developing without their use. These cracks appear because your house swells and shrinks with temperature and humidity changes and different the materials that make up your house will do so at differently. Its your call do you want to override the architects orders of a nice intentional uniform indentation in your large ceiling or do you want to run the risk of an ugly crack. Metal lathe is used when installing drywall is impractical such as for large curves on walls and ceilings. It is also very effective when you have unstable horse hair plaster and it is not desirable to gut the area or very high stress points as in transitions from concrete or cinder blocks to wood framing. Wood Lathe are the thin wood strips used in the old horsehair plaster. Wood lathe is still used in plastering, but its use is usually reserved for homes and building that are listed as a historical land mark. This is required in order to maintain the legal standing of historical landmark. Ignoring this fact when having repairs done can have huge financial implications in the form of taxes and/or fines. Sheetrock is identifiable by the smooth relatively non-pourous type of paper on its exterior and is finished by applying multiple layers of joint compound in a process known as taping or mudding. The individuals who finish dry wall by applying joint compounds are commonly known as tapers to differentiate them from true plasterers. Commercial building are almost always finished using sheetrock. Sheetrock is also replacing blueboard and plaster at an ever increasing rate in new homes to cut cost, especially when size is more important then quality but there are sacrifice. Some of these sacrifices are life expectancy and safety, discussed later. Plaster is definitely a better choice when it comes to remodeling, see the Remodeling Challenges discussion farther down the page. Joint Compounds: There are many types of joint compounds, The most well known variety comes in a five gallon bucket and hardens by drying. Professional tapers will on occasion use one of the setting varieties that come in powder form and are mixed with water which creates a chemical reaction causing them to harden. Once harden these setting joint compounds hardens it still has to dry. Setting joint compound can be purchased with a variety of setting times. They are used as the first layer or coat and must have two additional coats of a different type of joint compound which comes as a mud in containers and after applied hardens by drying. The standard process calls for a minimum of three coats of joint compound each coat must be dry before the next one is applied and before the finally sanding. In the end what you end up with as a finish product is a wall or ceiling that is primarily a paint covered paper surface. Unlike blueboard and plaster you can mix and match products from different manufacturers when it comes to sheetrock and joint compound. The reason Joint compound is called mud is because most of them will become soft again if they get wet unlike plaster which stays hard. Life expectancy is defined as the time it takes for the product to deteriorate to the point where the loss of aesthetics can be observed. The life expectancy of sheetrock and joint compound finished surfaces is much shorter then it is with blueboard and plaster. The main reasons for the differences in life expectancy is that joint compound has a very low tensile strength, is very susceptible to moisture and lets face it you the majority of the wall is nothing more then paint covered paper unlike plasters. The humidity in and outside of your house changes and these humidity changes will penetrate into your walls which cause swelling and shrinkage of the drywall and joint compounds. Temperature changes also cause the different materials of your house to expand and contract at different rates. Over time this movement can cause screws and joints to start to show up. Plaster walls on the other hand create a uniform surface of stone which is much stronger then paint covered paper. Safety: House fires, while rare are where the safety differences between joint compound and plaster come into play. 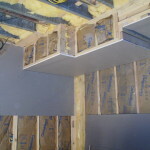 One type of drywall are the Fire Rated Drywalls, these are require in garages and on walls and ceilings that abut adjacent apartments, or common areas such as halls between apartments. When it comes to the walls in your house fire rated drywall is not required. Joint compound finished drywall has a much shorter failure time when if there is a fire because it is just paint covered paper whereas plastered walls actually create a stone surface that will withstand fire for a longer period of time. The use of Kal-Kote base coat over half inch blueboard (half inch thick drywall is what is used in a houses interior walls) will provide the same fire rating as the thicker fire coded sheetrock. The discussion surrounding greenboard will be the shortest so let us get that out of the way quickly. 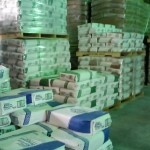 Greenboard, also known as moisture resistant drywall (not moisture proof) is used with joint compound finishes but if a bonding agent is applied a two coat plaster method can be used. Green board may be useful in high humidity areas however it is much better to control the humidity/water for several reasons. The first reason is if you are having that much problem controlling moisture you are probably going to develop mold somewhere you can’t see. The second issue is if you have small water leaks or the cement floor is sucking up moisture from the ground and wicking it into your wood studs, all to often by the time damage appears in the greenboard the wood framing behind it has rotted. Personally I would rather catch the damage early and limit the repair costs. 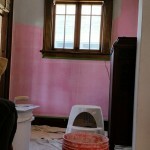 Remodeling can present a lot of challenges that make plaster a much better product then joint compound for finishing. If you have an older house at some point you may find that the walls have gotten beat up and need to be resurfaced or gutted and replaced. If your walls are structurally sound and the paint is not flaking off a bonding agent can be applied to the walls and a two coat plaster system can be used to refinish them. Frequently I will cover the walls with large sheets of fiberglass mesh to help prevent cracks from developing in the future of from reappearing and the mesh provides additional structural integrity to the walls. This not something that can be accomplished very effectively by joint compound. When walls and ceilings are gutted and reboarded with drywall or when drywall is screwed up over the existing wall you will have subtle waves in the surface. Plasters are very effective in filling up the low areas and making a level/flat surface whereas sheetrock can actually exacerbate this because the finishind of joints and nail heads is accomplished by creating high areas as layer upon layer are applied. These whoopi-de-doos as we like to call them are more apparent after it is painted and can become even worse when lights are on intensifying the shadows the situation causes. When old plaster walls are gutted the door and window jams may require heavy and varying fill depths to flush them out for the trim. In homes that have horse hair plaster and have had insulation blown into the wall cavities it is not always necessary to remove the wood lathe however after installing drywall there can be large spaces where the drywall slid behind the trim that was not removed which require thicker layers of plaster to flush the wall to the trim. Plaster is much more effective then joint compound in these situations. When Old horse hair ceilings or walls start to go bad they often do not require complete gutting and can simply have a new layer of blueboard screwed up over the existing plaster however you usually run into areas where the screw head is too small to effectively withstand the forces of tightening the loose plaster to the underlying wood lathe and will pull through the drywall. In these instances there are special fasteners that need be used but unfortunately they require the use of plaster in order to properly bury them so you do not have huge bumps. Without using the buttons in these situations you run a very high risk that the screws will pull through and you will end up with problems in the not to distant future.